Everything about me screams Americanized Filipina. Although I crave Filipino food once in a while, I don’t own a rice cooker. I’m married to a Caucasian husband who wore a barong to our wedding, the only Filipino thing about the event. Sure, there are the fish sandwich reviews around Lent, but we don’t celebrate the religious side of Easter since we’re agnostic. And the few words I know in Tagalog include eye booger, I love you and a few food items. But despite all this, there is one tradition I hold dear to my heart and that’s eating noodles for my mom’s and brother’s birthday. Eating noodles or pancit on someone’s birthday in the Philippines is for a long life. Not a birthday goes by that we haven’t celebrated by eating a dish that incorporates noodles. Frankly, I didn’t appreciate the practice then and would rather just eat cake. But as the years go by, I want both of them to stay around for a long time. For my mom’s and brother’s birthday this year (celebrated on March 6 and 19 respectively), I made pasta carbonara using calamari linguini. Calamari is an ingredient in the pasta but there’s no squid taste. 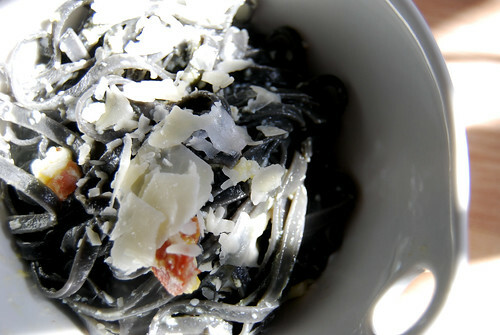 The pasta is instead colored with squid ink. The black pasta (which is less intense after it cooks) looks dramatc against the shaved cheese in pasta carbonara that incorporates some of my favorite ingredients: pancetta, garlic, eggs and cheese. While it’s not pancit, it ranks pretty high up on my list of favorite recipes I like to make in honor of some very dear people in my life. Cook pasta according to directions until al dente. Drain reserving a 1/2 cup of cooking water. Heat a large pan and cook pancetta until crisp. Remove pancetta from pan and drain on paper towels. Add garlic to remaining oil in pan and season with pepper until lightly brown. Return pancetta to pan and add cooked pasta making sure to ingredients are throughly combined. Remove pan from heat and add eggs, whisking quickly until thickened. Make sure not to scramble. Add reserved pasta one tablespoon of reserved pasta water if needed to thin out eggs. Add cheese and season with salt. 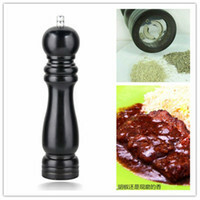 What a nice mention of you mom and brother and equally nice recipe. Happy birthday to them! Darn! I knew I forgot something. Plus the parsley would be so pretty against the black pasta. I like the look of that squid ink pasta. I’d love to make this but the only thing about carbonara that makes me squeamish is the eggs (which I know is pretty much the main part of the recipe). Does the dish taste eggy? Is it because the eggs are raw? They cook fairly fast with the hot pasta. You just have to move very quick. As for the taste, it’s more creamy especially combined with the cheese. I would try it at a restaurant first and then attempt it at home. Yes! Muta!!! LOL!!! Yes, raw eggs gross me out, but I feel better having read and seen your recipe. I feel a little more “brave” now to try making this, ha ha! I’m married to a Caucasian husband, too, although we do own a rice cooker (thanks, Mom!). But, I do love the long noodles = long life, so we eat pancit or spaghetti for birthdays. It’s a good fit for us, especially since my husband is Sicilian and makes a mean marinara! I’m going to have to try your recipe and hunt down some squid ink pasta. Yum! Yes! My mom is shocked I don’t own a rice cooker and wants to buy me one. BTW: I got the pasta from the Mission Hills farmer’s market so it might be available at other outdoor markets around San Diego. They even sell chocolate pasta! 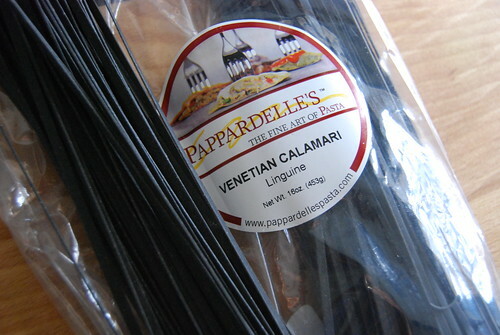 I had seen the squid ink pasta at one of the farmers markets, too. Although it’s terribly dangerous to know there’s chocolate pasta out there — imagine it with some Nutella and sliced strawberries…Yum! That pasta looks awesome! Love the color of it. I haven’t head of this one before, and I’m half Filipina. I guess my mom failed to tell me about this one… I’ve heard about eating long noodles on New Year’s, but that’s it. Happy birthday to your mom & brother! Oh my. Pasta that’s not white freaks me out!